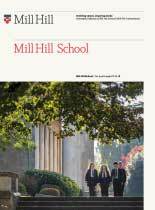 Mill Hill School offers co-educational Day, Weekly Boarding and Full Boarding places. Entry is available at 13+ (4th Form), 14+ (Year 10) and 16+ (Sixth Form). Please note that Y6 Track for entry in September 2020 and the Y8 Track for entry in September 2019 entry is now closed. We have a Year 9 intake of around 150 pupils (13+), around 10 pupils join Year 10 (14+) and typically between 40 and 50 pupils join us at 16+ in the Lower Sixth. In addition to day places we also offer both Weekly and Full Boarding. Parents considering 13+ entry for their child should follow the Early Testing Track when their child is in Year 6; applications must be made by the end of November of Year 6, references are requested in November and there is an Assessment Day in early November comprising computer-based tests in Reading Comprehension, Verbal, Non-verbal and Numerical Reasoning. There is also an interview and a small group activity. Our Year 6 Track 13+ application process for entry in 2020 is now closed; to be placed on our waiting list please contact us. The next Year 6 Track 13+ application process for entry in 2021 is now open; the deadline for receipt of registration forms is the 16 November 2018. Please note: CEM’s assessment familiarisations use Adobe Flash which does not run on iOS. Please open on a Windows or Mac OS X computer enabled with Adobe Flash. The familiarisations will not open on iPhone and iPad as these do not support Adobe Flash. We may also have a limited number of 13+ places available to candidates in Year 8, however this can not be guaranteed. Applications should only be made after an initial enquiry to confirm availability. Assessment is by written examination in English, Mathematics, Science and French, with the option of Latin. Individual interviews are held for candidates who have performed sufficiently well in the test papers. Sample papers are available on request. The next Year 8 Track 13+ application process for entry in 2019 is currently open, however places are limited and early registration is recommended. From the 2020 intake onwards the Year 8 Track will no longer be available, with chance vacancies only. Candidates for entry at 14+ (Year 10) are assessed by interview and written examinations in English, Mathematics, Science and French; applications should only be made after initial enquiry to confirm availability. Sample papers are available on request. Sixth Form candidates are encouraged to apply in the Autumn Term of the year preceding entry, and are generally required to have a minimum of 2 A and 3 B grades (or the numerical equivalent, A = 7, B = 6) at GCSE, with some subject-specific requirements. We request confidential references and predicted grades from candidates’ schools, and based on this information, those who appear to be most likely to be academically suitable are invited to interview. Offers are made to successful candidates, conditional upon achieving the required GCSE grades. A wide variety of Scholarships, Awards and Bursaries are available to candidates resident in the UK. We encourage prospective pupils and parents to visit the School – either on one of our Open Mornings or by special arrangement for a personalised tour. Candidates resident outside the UK should first contact the Admissions Team to check availability of places, and should then submit their two most recent school reports, which will enable us to advise on the suitability of the academic profile. Suitable candidates will be advised to register and arrangements will be made for testing either at Mill Hill School or at an approved agency overseas, including the candidate’s current school. For 13+ (Year 9) and 14+ (Year 10) entry examinations will be taken in English as an Additional Language and Mathematics. An interview will be conducted either face-to-face or by Skype for candidates who are successful in the written tests. For 16+ candidates (Sixth Form) who are not following a GCSE curriculum, or who require a CAS (Confirmation of Acceptance for Study), examinations will be taken in English (or English as an Additional Language) and, depending on subject choice, further tests in the subjects for which they are applying to study at A Level. For those following GCSE courses who do not require a (CAS), successful candidates will receive an offer conditional upon specified GCSE grades, and will be required to sit entrance tests.